“I now feel proud of my work as a farmer and the success I have made this far. My family is not only food and nutritional secure but we are making a living through sale of surplus produce from this farm” says Victoria Mumo. Victoria Mumo hails from Kithendo village in Kithimani Ward, Yatta Sub-county of Machakos County. The climate of Machakos County is semi-arid with erratic and unpredictable bi-modal rainfall pattern. The rainfall ranges between 500mm to 1,300mm annually. 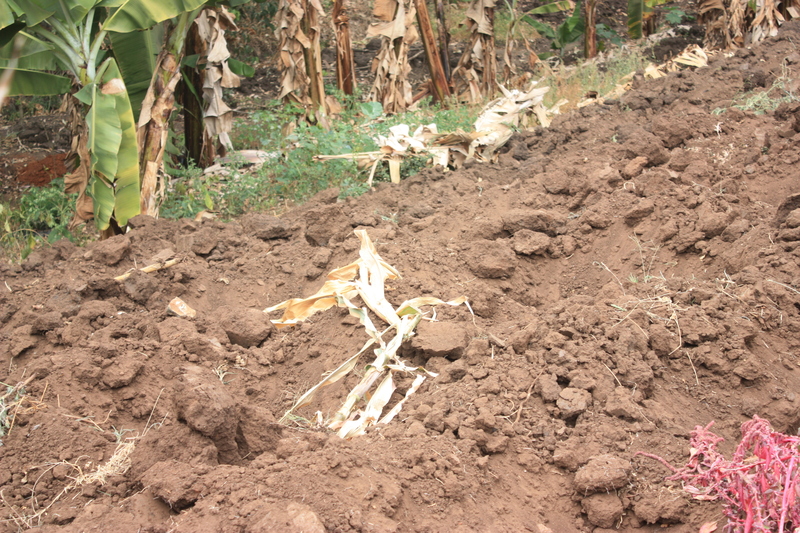 Just like many other parts of the country and world, farmers in Yatta have experienced frequent crop failures, water shortages due to weather aberrations which have manifested in different forms such as delayed and untimely rainfall, increase in temperature among others. Victoria’s journey to success began when her group, ‘Muuo wa Canaan’ started working with ICE in 2014 under a project that aimed at building capacity of small holder farmers to adapt to effects of climate change. The project implemented in 2014-2015, embarked on creating awareness among community members on effects of climate change through sensitizing them on unsustainable land use practices; On-farm trainings on agro-ecological farming practices including diversification of farm produce; Providing exposure learning visits and supporting farmers with seeds for livelihood diversification between crops and livestock. Household food security was given priority in view of the uncertainties in production. From the project, Victoria gained interest to change her farming practices in order to improve the productivity of her farm. She said she was happy that her husband supported her desire to improve the productivity of their farm. 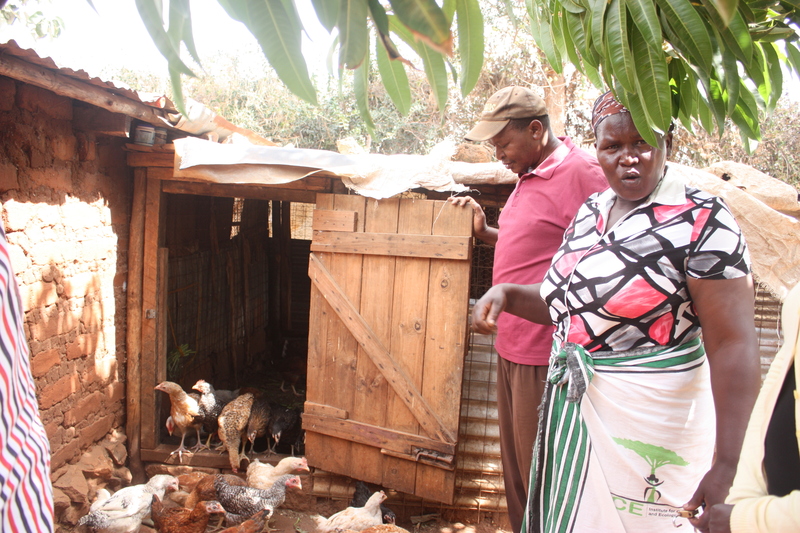 They started by establishing on farm water harvesting structures and construction of house for rearing poultry in a bid to diversify their farming. 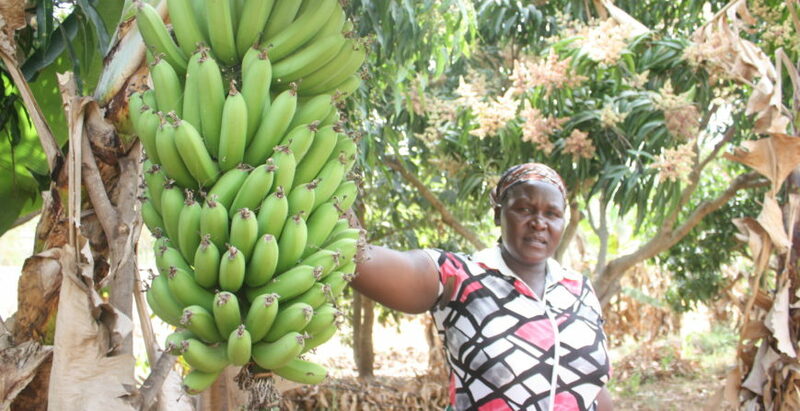 Since adoption of the new farming practices and diversifying their farm as trained and advised by trained by ICE Kenya, the family now has managed to use their farm optimally and increased the production and income threefold. Farming has now become full time job for Victoria and her husband who previously worked as a hotelier. In their farm, Victoria and her husband have more than seven crop varieties on their farm including; Cassava, pigeon peas, sweet potatoes, bananas, mangoes, beans, maize and varieties of indigenous vegetables. “When farmers come here, they are surprised that I have been able to grow even crops such as bananas in this dry area”, She proudly says with a lingering smile. 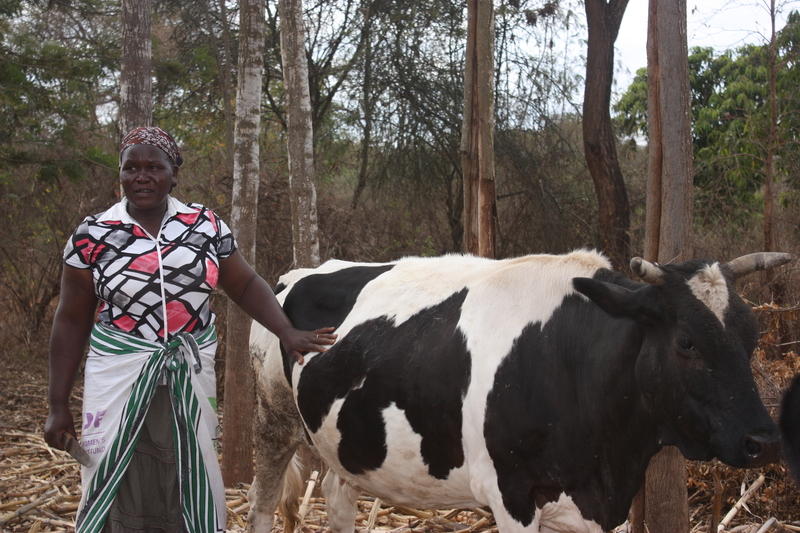 In addition, the family has two dairy cows and more than 250 improved kienyeji (local) chicken. The sale of milk, eggs and chicken earns them income to meet their dairy needs before crop harvest. In 2016, ICE started another project in Yatta that aimed at improving economic empowerment of women smallholder farmers in Machakos County. The project has facilitated training of women groups on record keeping, marketing and managing village saving and loaning amongst the group members. Victoria’s group was one of the groups engaged in the project among fourteen women groups in Machakos County. The knowledge and skills enabled Victoria become an entrepreneur farmer hence able to market her produce and earn higher income than before. She is also able to keep records as well as evaluating operation and production in order to determine pricing and marketing. In her village, Victoria is a model farmer who has strived to overcome the detrimental effects of climate change. She now understands well that as the climate changes, farmers need also to change. She understands that resilience is accepting the new reality even if it is less good than the one before. It is about being able to overcome the unexpected by striving to survive. Resilience in the face of adversity. Part of her farm where she had prepared Zai pits in August 2016 in preparation to plant crops in October-December rains.